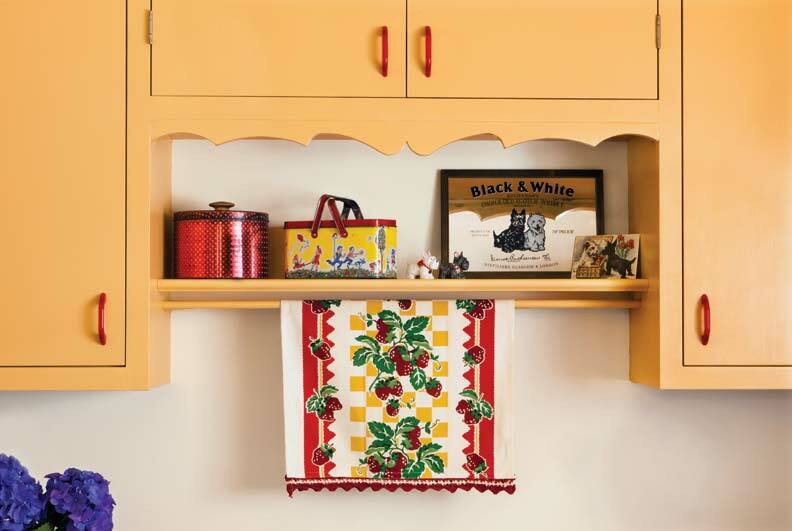 Kitchen accents include vintage working accessories: a hammered aluminum platter, a beehive cookie jar, a tin cake plate, and hand-painted wood canisters. 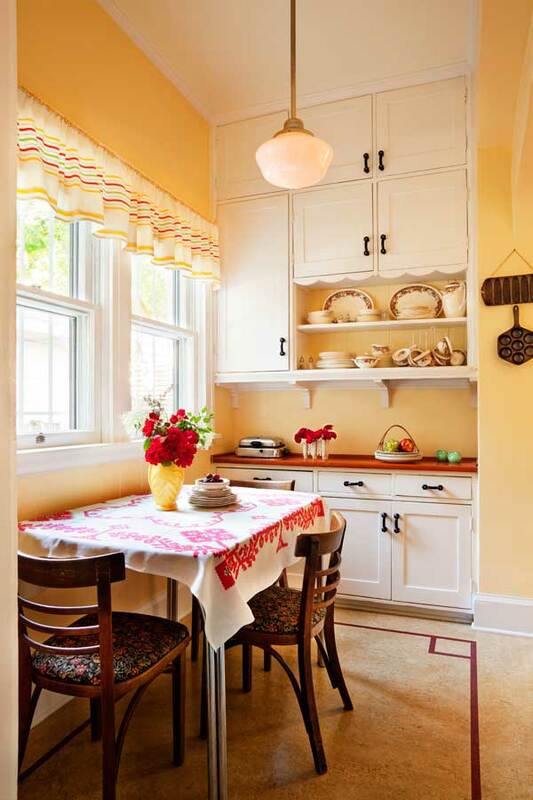 Five years ago, the owner of a 1911 Craftsman house bought some vintage cabinets off Craigslist, intending to make over the 1970s kitchen she’d inherited. Because she never found a contractor who would agree to work with them, the cabinets sat in the garage, gathering dust. Then, “one of the nasty, dark 1970s cabinet doors fell off its hinges, and there was nothing but crumbling particleboard to hinge it back into,” the owner says. “I’d reached a tipping point.” Time to either sell the cabinets or undertake a whole-kitchen remodel—or sell the house. Although she was reluctant to spend a lot of money on the remodeling, she knew that the current kitchen was hurting the value of the otherwise well-maintained house. 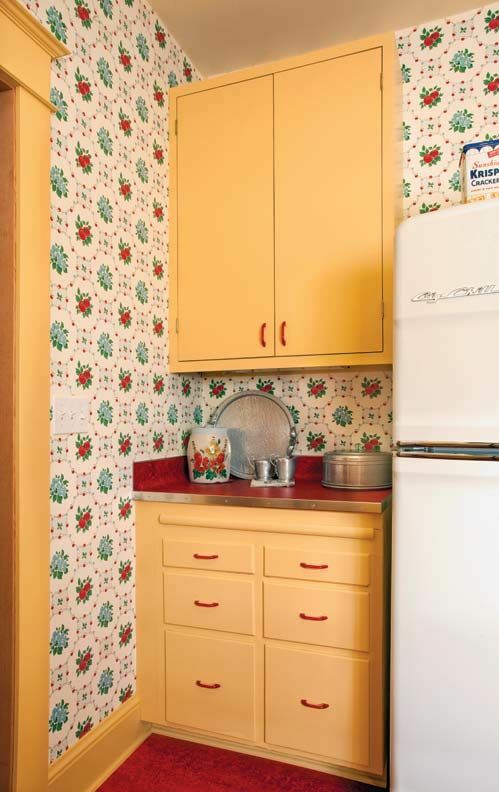 Karla determined that the cabinets had come from a 1940s-era kitchen, based on their simple plywood doors. “I told her that I would not buy them,” Karla says, “but instead she should keep them, and together we could create a fabulous kitchen for her house." Some favorite things from the owner’s childhood sit on the display shelf under a cabinet trimmed in a scallop detail borrowed from the cabinets bought on Craigslist. Mike explains that he “wanted to help her out, knowing other contractors had given her outrageous bids, and had insisted on using ‘everything new.’” Over Thanksgiving weekend in 2011, the owner’s two grown nephews removed the heinous old cabinets, the dropped ceiling, and the 1970s vinyl paneling. The next day, another family team took damaged drywall down to the studs. 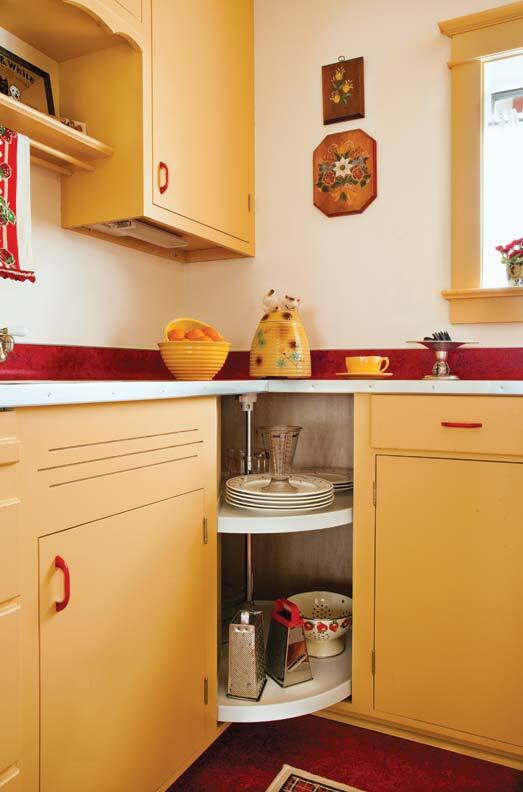 As Mike’s subcontractors installed insulation and new drywall, and adjusted the plumbing, Karla brought out a 1941 Sherwin Williams “Style Guide” that featured a bright yellow and red kitchen—colors the homeowner embraced wholeheartedly. 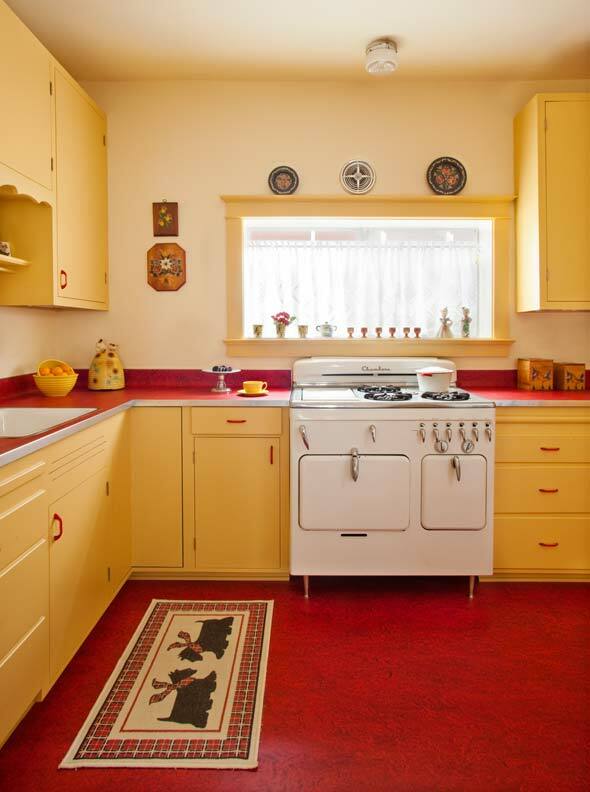 Colors of the era are echoed throughout the kitchen. Note, too, that the woodwork is painted the same color as cabinets. 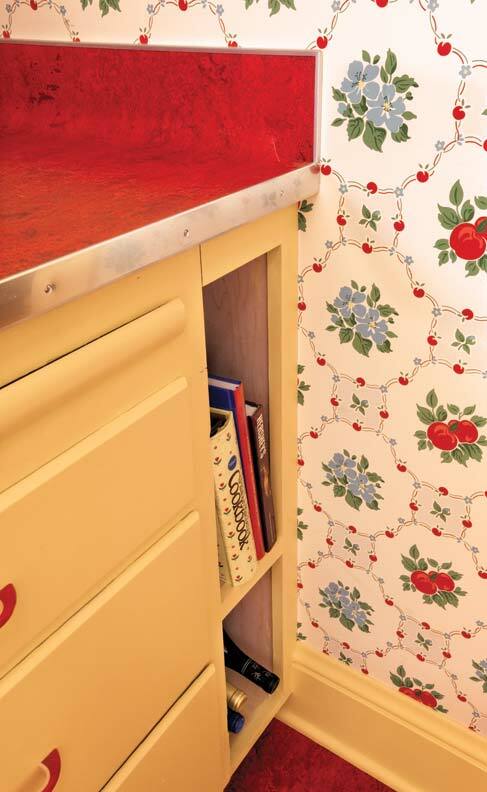 The sweet reproduction wallpaper clinches the look. “I made new cabinet units to match the vintage ones,” Mike explains, which filled out the run of cabinetry. Karla found the 1940s Bakelite hardware. She also located the 1940s Chambers gas stove through Liz Covey of Ruthie’s Antiques in Chicago, and had it rebuilt locally. 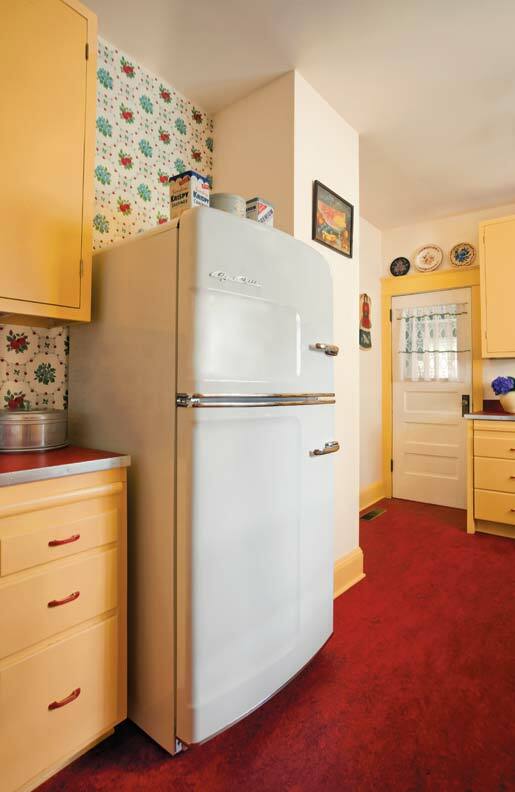 She talked the owner out of buying a vintage refrigerator, because their tiny freezers require frequent defrosting. Instead, she recommended looking for a discounted “scratch and dent” fridge made by Big Chill. 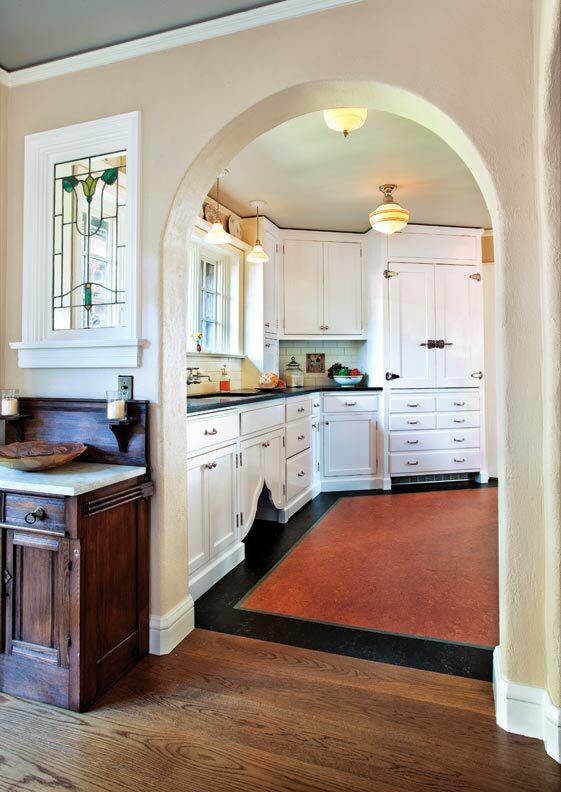 Leftover red Marmoleum flooring became the countertops, while the hollow-core door to the mudroom was replaced with a vintage one from a salvage shop. Postwar floral wallpaper from Bradbury & Bradbury is the final touch.